It has the same fluffy texture and round shape as gnocchi, but none of the heavy carbs to hold you down. 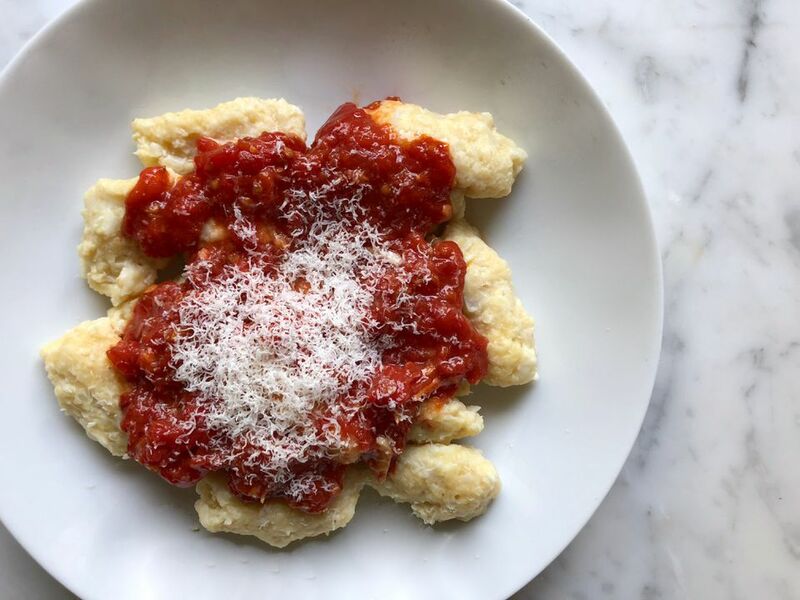 In this gnocchi, riced cauliflower takes the place of the traditional potatoes to form a low-carb, gluten-free take on an Italian classic. The gnocchi is delicious topped with tomato sauce, as pictured here, butter and Parmesan, a sprinkling of herbs, or a luscious cream sauce -- whatever strikes you. Trim the cauliflower, discarding any leaves or discolored spots. Separate the cauliflower into small florets and chop any stems. If you have a food processor, pulse the chopped cauliflower until it's a texture somewhere between rice and sand. Transfer the riced cauliflower onto a large, clean kitchen towel. Bring up the corners and sides and twist into a bundle, squeezing as much excess water out of the cauliflower as you can. Be aggressive! The more water you squeeze out now, the better the gnocchi will be. Set aside. In a large bowl, beat the egg until it's completely combined. Stir in the mozzarella, Parmesan, and salt. When it's all combined, give the cauliflower one more twist and squeeze. Add the cauliflower to the egg and cheese mixture and stir to combine. Sprinkle on the flour and stir to combine thoroughly and completely. You should be able to pinch a bit of the dough and have it hold together; if not, sprinkle in a tablespoon more flour at a time until it does. You want a dough that holds together or it will fall apart when you try to cook it. Bring a large pot of water to a boil, adding enough salt so it tastes a bit salty. While the water comes to a boil, shape the gnocchi. You won't be able to make the pretty dents with the tines of a fork as you can with potato gnocchi. Instead, divide the log in 2 and, working with one at a time, roll each into a long about 1-inch in diameter. Use a knife to cut it into 1/2-inch long chunks and with clean, damp hands, roll each one into a gnocchi-like shape. Repeat with the second log. Keep your hands clean and damp to keep the dough from sticking—rinse them off every few gnocchi. When the water comes to a boil, test cook one gnocchi: add it to the pot, gently stir it so it doesn't sit on the bottom of the pot, stop stirring and wait for it to float to the surface, about 1 to 2 minutes. Use a slotted spoon to transfer it to a colander or plate. Taste it to see if it needs more or less cooking time. If it falls apart; return the dough to a bowl, add more flour, and start again (that's why the pinch test in step 4 is so important!). Cook the gnocchi in batches—they should fit in the pot in a single layer. Keep them warm in a 200-degree oven as you cook more batches. When all of the gnocchi is cooked, serve them hot with tomato sauce and Parmesan cheese or the sauce or topping of your choice.